There Are Many Ways To Show Encouragement. 4). Give a sincere complement. 7). Point them to an applicable scripture. Consider Psalm 32:8 Share scriptures that speak directly to their situations. 8). Tell them the truth. 10). Be a good example. 11). Give Godly correction. I care what's going on in your life and I am thinking and praying for you, but if you keep heading the direction you are going your going to make a terrible mistake. Say it in a loving way. 12). Give a thoughtful gift. 12). Sacrifice your time to be with a friend who may be lonely. 14). Weep with those who weep. 15). Express affirmation and agreement when possible. 16). Share scriptures that speak directly to their situations. 17). 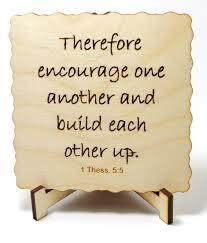 You can also encourage others by being a good example to them and giving loving, godly correction. 18). Agree when its appropriate. Yes that's right. I completely agree. 20). Give them your full attention. 21). Be patient. I willing to wait until they say what they should be saying, or feel what they should be feeling. 22). Give a meaningful gift. 24). Pass on some helpful information. 25). Assisting them in an area in which they feel inadequate. Be helpful. 26). Show your loyalty—let people know they can count on you. I appreciate what you do. you can count on me. 27). Don't be afraid to say, "I love you," especially to your family. 28). Love those whom they love. Your my friend, I love you so I going to also love the people who love you. 29). Finally, the easiest way to be an encouragement is simply to smile.